Black and white cartoon, dated 1st October 1807, showing three British sailors towing Danish ships into harbour in a boat named The Billy Pitt. 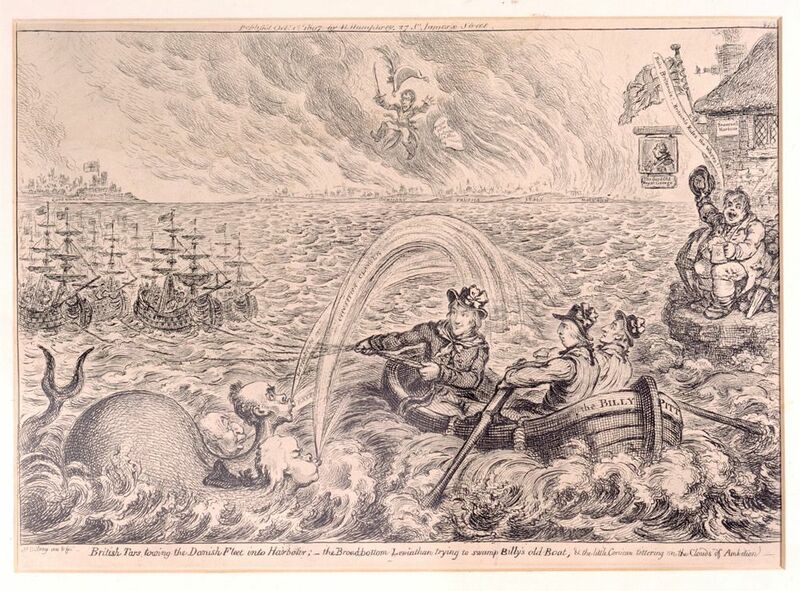 Lord Grenville, Charles James Fox and Lord Sidmouth, who formed a coalition government after the death of William Pitt in 1806, are pictured as sea creatures blowing water on the boat.This represents Britain's attack on the city of Copenhagen in 1807. The expedition was prompted by fears that Napolean would seize the Danish fleet and turn it against Britain, since although Denmark was neutral, she was thought to be susceptible to pressure from a new alliance between France and Russia. Napoleon can be seen in the background having been forced out of the European countries of Poland, Germany, Prussia, Italy and Holland. On the right a man is seated outside a pub singing Rule Britannia. This British Tars Towing the Danish Fleet into Harbour Art Print is created using state of the art, industry leading Digital printers. The result - a stunning reproduction at an affordable price.